It’s officially September, and perhaps you’ve spent the last week getting back to business in a most eager and industrious way, relishing the smooth efficiency and predictability that the end of summer brings after months of working around everyone’s crazy vacations (lucky you). Or, perhaps the transition has been a bit (ahem) bumpier, and you find yourself trading productivity for daydreams, reliving your experiences getting off the grid, in the air to somewhere, or conversely, back to the land. Either way, the Textile Museum’s current exhibition, Dreamland, is a worthwhile diversion and touchstone for your early Fall art viewing, a good way to ground yourself at summer’s end, so to speak. On view through September 30th, the show ranges widely in it’s interdisciplinary approach to textiles and the Canadian landscape. Featuring both fine and folk artworks that share an expressive and intimate relationship to a particular time and place, Dreamland’s curators juxtapose the traditional and historical (hooked rugs, handkerchiefs) with the contemporary and high-tech (video, installation), challenging the viewer to make connections between them. And a challenge it is. For although the contemporary artworks and historical crafts on display both embody the uniquely human fascination and yearning for an idealized vision of nature, the vast differences in scale, style, materials, methods, and purposes between the two groups of works cause them to remain strangely irreconcilable. As a result the exhibition practically functions as two interwoven yet separate shows, each with work featuring similar inspiration and imagery, but neither intent nor effect. 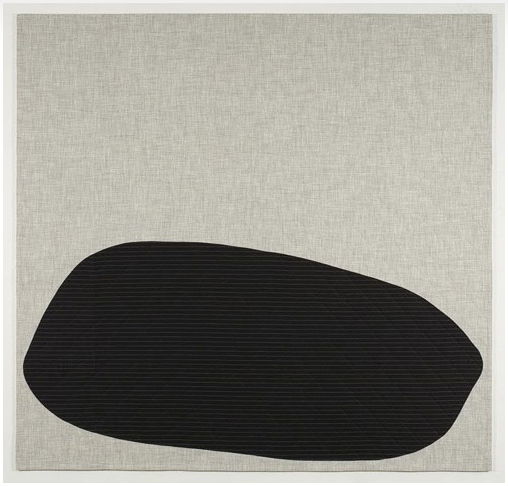 An interesting tension does exist between old and new, large and small, literal and conceptual, material and immaterial – and a few of the works do manage to blur those boundaries – but overall it is the contemporary art that steals the show, both visually and conceptually. 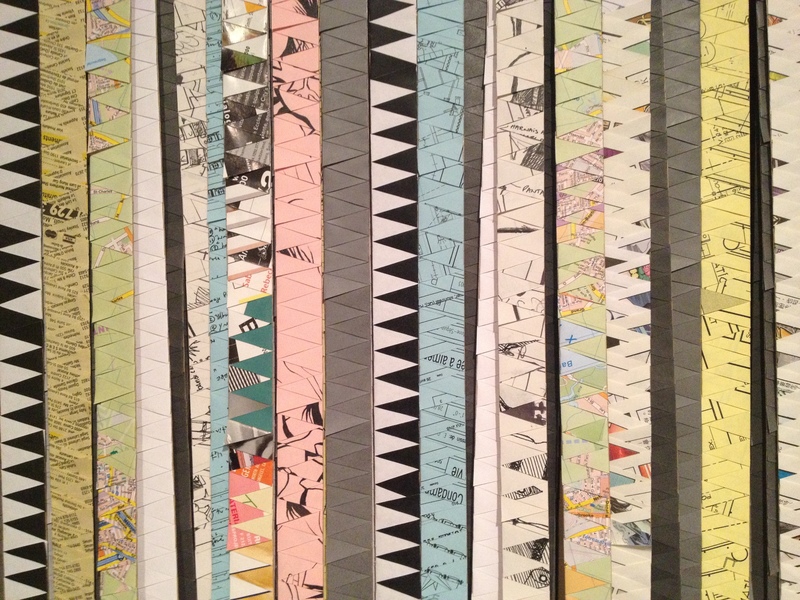 One example is Jérôme Fortin’s Self-Portrait no.4, which features his trademark folded paper strips, this time comprising maps and found materials from his home and travels arranged sculpturally to resemble a kimono display. 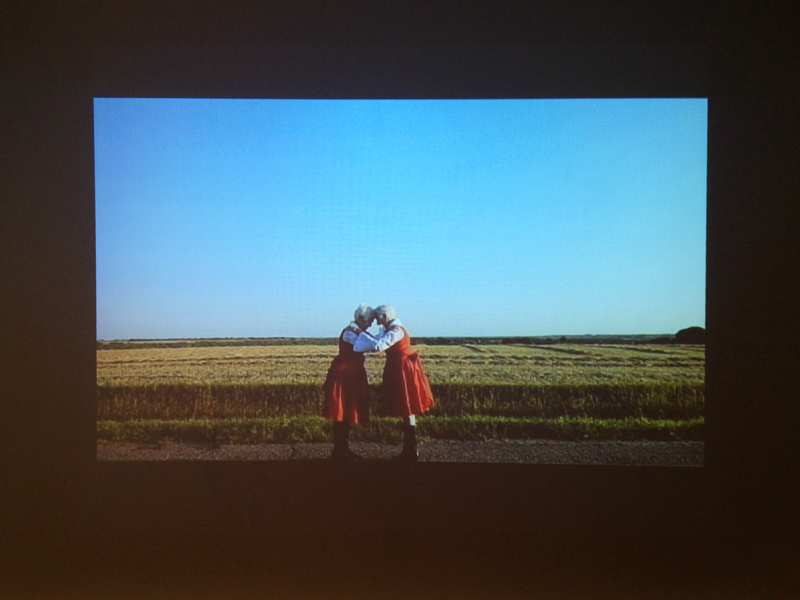 Amalie Atkin’s hauntingly beautiful video, Embrace, captures a tender moment between twins against a backdrop of expansive fields and blue Saskatchewan sky. 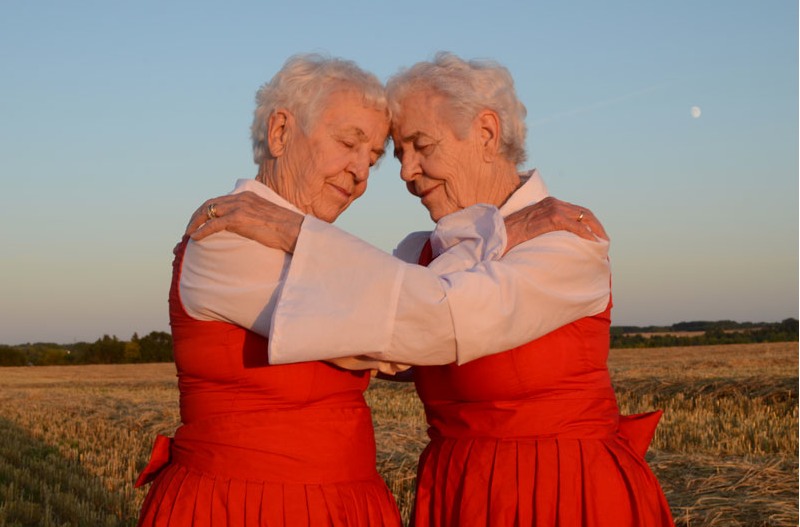 More compelling than the final embrace featured in this still are the opening moments of the video, during which the sisters engage in an unscripted dance of false starts and hesitations before finally proceeding toward one another from opposite edges of the screen. Equally poignant is the soundtrack, composed of a slow and imperfect, yet surprisingly satisfying, piano rendition of Edelweiss — the sisters’ favorite song. 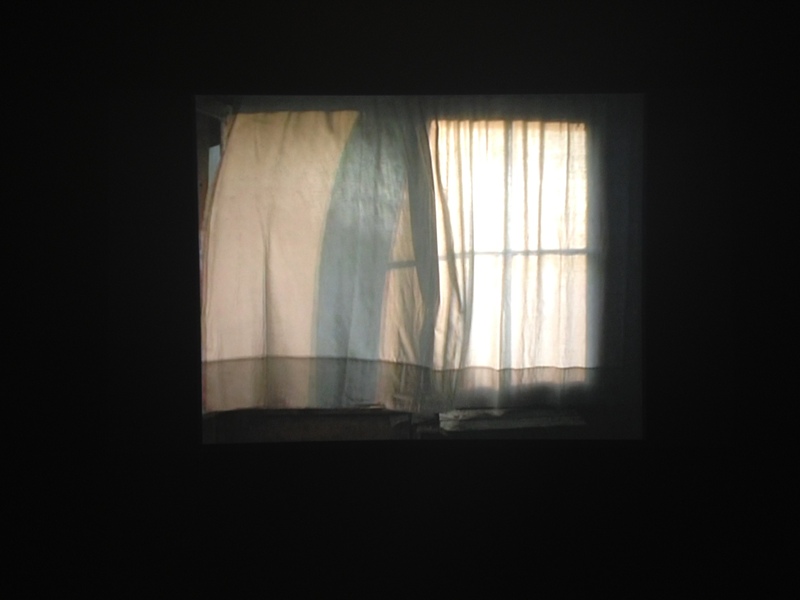 Michael Snow’s Solar Breath (Northern Caryatids) documents one hour of breezes blowing through an open window at his cottage in rural Newfoundland. The curtain, billowing softly and then slapping suddenly against the screen in turn, is the inhalation and the exhalation of the house itself, becoming a meditation in motion. Projected on the wall at actual size, the window is a portal to another world – whether Newfoundland or your own soul is up to you. 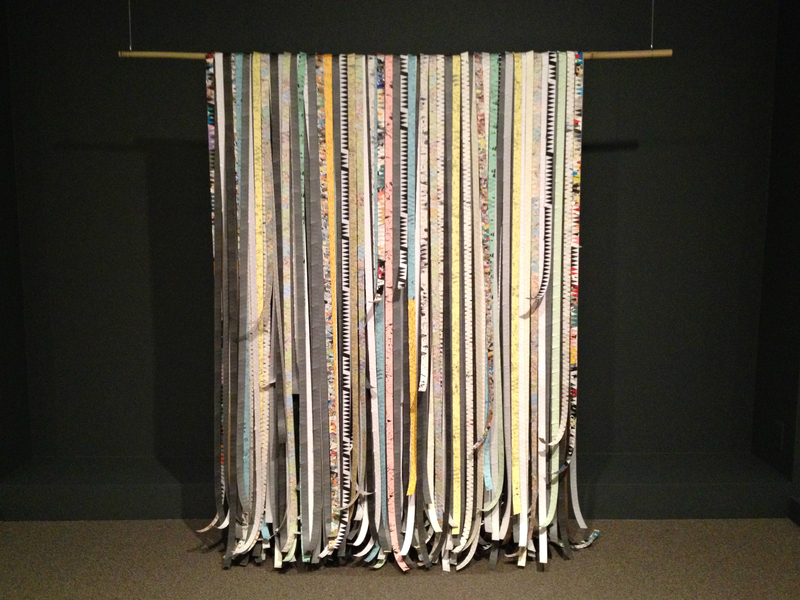 Dreamland: Textiles and the Canadian Landscape is on view at the Textile Museum through September 30th. Artists include Amalie Atkins, Douglas Coupland, John Henry Fine Day, Jérôme Fortin, Grant Heaps, Jason McLean, Graeme Patterson, Ruth Scheuing, Michael Snow and Barbara Todd. Curated by Shauna McCabe, Natalia Nekrassova, Sarah Quinton, and Roxane Shaughnessy.